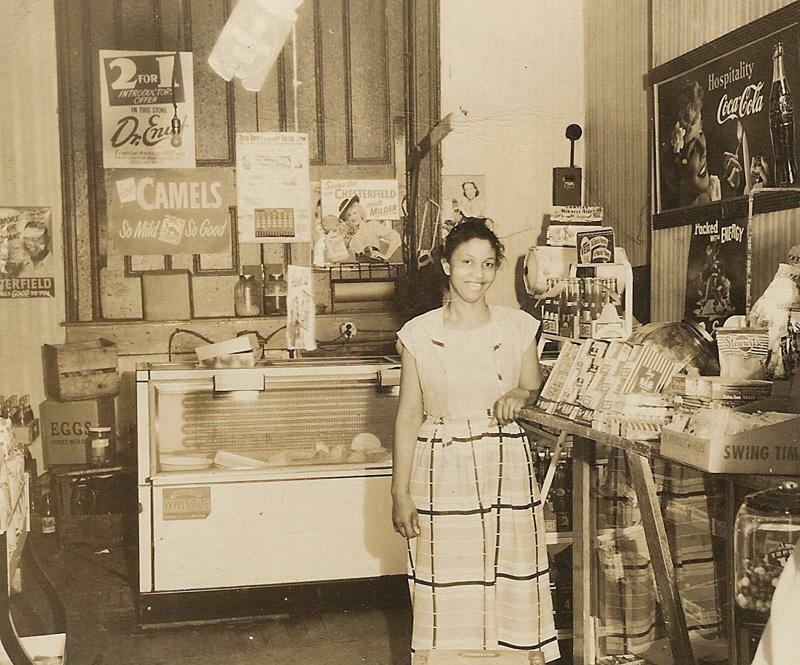 Lillie Pearson, age 33, at Tillie’s Food Shop in 1948. 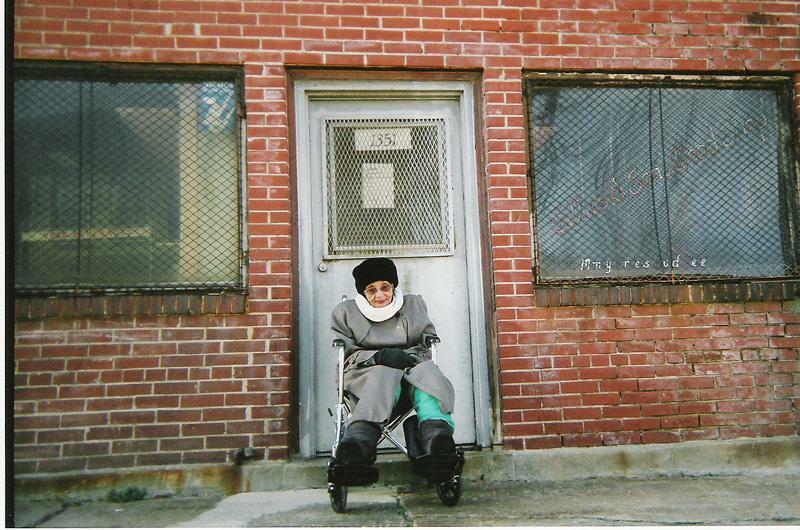 Lille Pearson, age 90, pictured in front of Tillie’s Food Shop. The popular grocery store closed in 2006. On the corner of Garrison and Sheridan in St. Louis stands a vacant building that for decades housed a thriving African American business. Its owner is remembered as an entrepreneur and informal activist during the civil rights movement. But now, the building is crumbling. This is a story about Lillie Velma Pearson, affectionately called “Granny” by everyone who knew her; and her granddaughter Carla Alexander. “She was actually a person of faith, a person of integrity, and she instilled a lot of moral values within our family,” Alexander said. Alexander and her husband Miguel are on a mission to document and restore “Tillie’s Food Shop,” the grocery store Pearson owned and operated from 1948 until 1988, along with two other buildings. Together the three buildings make up the area Pearson called “Tillie’s Corner.” It’s located across the street from Dunbar Elementary School and not far from Vashon High School. Peering through the murky windows you can see shelves and other remnants of the store. “We don’t really come in here a lot because of the damage. The roof got bad, and it just made a lot of leaks and stuff like that,” Alexander said. The Alexanders devote much of their time researching the historical significance of Tillie’s Corner in hopes of getting historical tax credits to begin renovations. They’d like to establish a tutoring center on the property. And they’re getting some help. A class led by Washington University in St. Louis History professor Sonia Lee is gathering information for an application to get Tillie’s Corner on the National Registrar of Historic Places. At the Missouri History Museum, Lee gives students instruction on how to interview former customers of Tillie’s Food Shop and shows them how to search the archives. Lee says she and her students are trying to get an overall picture of black businesses in the 1940s and 1950s, many of which enjoyed rich, commercial success. The interviews will be used to build a local archive of black and female-owned St. Louis business history. Lillie Pearson opened Tillie’s Food Shop in 1948 after her husband passed away. With five children to raise on her own, she was looking for a job that would allow her to take-off when she needed to care for them. Carla Alexander says her grandmother purchased the business for $246. Through the years, Alexander says Pearson looked after and inspired many people in the community. Pearson would also offer credit to people who couldn’t afford to pay for food. But Sonia Lee says the main thing they’re trying to prove is that Pearson was an informal activist in the community. “The first evidence we gathered was from the former alderman of the 19th Ward, Mr. Michael Roberts, he told us that when he was campaigning for his position in the late '70s, he made sure to stop by her store and let her know about his campaign because she had the love and respect of the community,” Lee said. When the neighborhood began to decline in the 1970’s Pearson refused to close the store because she felt that the community needed a place to buy high-quality food. She finally closed down in 1988 because of poor health. Pearson died in 2006 at the age of 91. Alexander says her grandmother always wanted to see Tillie’s Corner thriving again. And opening a tutoring center would fulfill that final wish.